If our customer have test & live environments. We first install the updates (either SP security or full CUs) on test environments, do a full test by adding, editing, delete data , check all the views ,managed services etc.. then based on the test result we proceed on installing these updates on live. Sometimes we notice that a security update caused some changes/problem inside the test , so we try to fix these on test first or postpone the updates on live if the effect of the update is large. Now the above 2 approaches have worked for us on many projects and environments and we did not face a major problems. 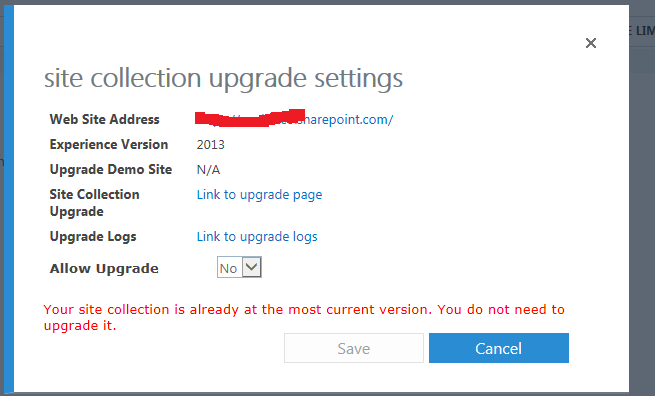 But now we want to start a new office 365 SharePoint project, and seems we do not have any control on installing the security updates as we do on the on-premise environments.. so not sure how we need to manage the security update or CU update inside office 365 compared to on-premise environments ? so when i chose Yes for Allow Upgrade does this mean that my site collection will automatically have the latest security updates + CUs ? and seems sharepoint will allow me to test these updates before applying them as there is a section called "upgrade demo site"? or upgrade inside Office 365 is different than installing security updates and CUs inside the on-premise ? You do not manage any server-side updates on SharePoint Online. Microsoft does this for you. For Site Collections, you can upgrade them to v15 mode if they're in v14.5 mode. But that said, any new Site Collection created in the past couple years is v15. Microsoft manages the SharePoint online infrastructure for you. So, you dont have any control over how updates are added. One thing that you can control is what release track you are on. Login to the admin center using Tenant administrator credentials. On the portal home page, click on Settings > Organization profile. There you will see the Release track of the tenant. There are 3 options here, First release, First release for selected users and Standard release. Note - If you are already on the First release and now you click on Standard release, you will lose the "New features" available via First release. Not the answer you're looking for? Browse other questions tagged office-365 administration installation cumulative-update farm or ask your own question.